Ian Plunkett is a Director of Japingka Gallery, and has had almost daily interaction with Aboriginal art buyers for over 25 years, ranging from first time buyers to some of the world's most famous collectors. In this interview, he talks about a range of issues relevant to those considering buying Aboriginal art. Q: Ian, who’s buying aboriginal art right now? How is the market changing? Well, that’s a very good question because it’s changed a lot over the years. My first experience with selling aboriginal art was actually in Europe when we had a gallery in Covent Garden in London. Selling there was a completely different experience because virtually no one there knew anything much about Aboriginal art at all. It was not only a matter of selling the art but also the culture, so there’s more of an educational experience for everyone involved really. This was in the 1980s. We had one of the first major exhibitions of Aboriginal art in Paris that was opened by ex Prime Minister, the late Gough Whitlam. A big group of Aboriginal artists and dancers also came across for the opening. It was a Jimmy Pike exhibition and this was when my interest in Aboriginal art first started. In those days, it was really mainly older people looking for something new. They saw our Aboriginal art as being exotic in Europe. They had never seen anything like it before. Of course, Aboriginal art is completely unique to Australia. There is nothing else like it anywhere in the world. I guess today what I find quite exciting is there are a lot of young people now embracing indigenous art. They’ve got a greater awareness of art and indigenous culture. When I went to school we were never taught anything about Aboriginal art or culture. We were taught about the great explorers but nothing about Aboriginal art. There was a big gap in my education and it's the same for anyone else born around that time. I know from my own personal experience that now when I give talks and lectures (as part of our outreach program) to young people from primary school age right up to university level that Indigenous Art & Culture is now a major and very important part of our curriculum. What I’m finding is that people are coming to the gallery with a good knowledge of the culture and quite a good appreciation of the art. Having said that, I think there's still not a great awareness of the diversity that exists in Aboriginal art. That only comes through experience and research. What I find really heartening and uplifting is that it's now the young people who are buying the art for the first time. It might even be for their rented apartment. This art is perhaps 40,000 years old in its origins and here it is appealing to young people in the 21st century. There’s something very contemporary about Aboriginal art that speaks to everyone. It’s not just a design exercise. It really is art from the heart. It is a spiritual undertaking as well. Q: When we talk about why are they buying it, what are their personal motivations do you think? Sometimes it really is as basic as looking for something decorative to go in a particular room by looking at the colour, and the composition, but it has to fit in with the room where it’s going to hang. Others are buying because they feel a strong connection to that piece of art. My advice to anyone buying art is not to buy for investment purposes because there never can be any guarantees. What I say to people is buy with your heart. Buy a painting that speaks to you because I know personally I’d rather be stuck with a painting that I love than a painting that I had no connection to at all. So always buy what you like, what speaks to you and you’ll get many, many years of enjoyment out of the painting like that. How Much Does Aboriginal Art Cost? Q: What does an Aboriginal piece of art cost? Do you know what price range people are mostly looking for? There’s a lot of diversity and a big range in prices. I’m really speaking for what we’ve got in the gallery here and we have just under 5,000 artworks available after over 30 years’ experience in the industry. The price range is from $125 for an original artwork up to the most expensive painting we would have would be about $155,000. It’s a broad range. The vast majority of artworks would be in the low to high hundreds and the low thousands, so the vast majority are affordable. Q: Can you help me understand why one painting costs more than another? How are these prices set? What are the factors? It’s no different at all to Western art. It’s really determined by the marketplace and that’s the secondary market like the auction houses, but it’s also in the reputation of the artist. If an artist is established, has a big market or a big reputation, has won art awards, is featured in many major solo exhibitions then there’s a natural demand for that artist’s work. There will be a year or two when a particular artist is in great demand and their prices skyrocket and then a few months, maybe a year or two later it plateaus out and there isn’t as much appreciation price-wise in their art after that. It is primarily determined by the market. Sometimes it may seem arbitrary, but a painting is really only worth what someone is willing to pay for it. Q: Do you find that collectors generally are buying individual works that appeal to them or do they tend to follow particular artists? Collectors are so varied. I do get collectors who have quite a bit of work by one artist and that’s fine if the artist has a diverse range of styles, but that’s not always the case. Sometimes a collector is drawn to one particular artist and they’d like to have their range of styles from when they first emerged as an artist right through to when they reached their peak and even paintings from later years. They’ll follow an artist’s whole career. Others will collect works on a community or regional basis. Someone might be drawn only to one type of art from a specific region for example, ochre paintings from The Kimberley. Others might be more drawn to the vivid acrylic paintings from the Western Desert. Others really just like to have as wide a collection as possible, a little bit from here, a little bit from there, from all around Australia from leading artists. We also have collectors who like to pick and support young emerging artists as they start their careers. Q: What is it like when someone buys their first piece of Aboriginal art? How frequently does that occur here in this gallery that you’re dealing with a first time buyer? It’s very common actually and it’s really rewarding especially when someone comes to the gallery with not a lot of knowledge or background about Aboriginal art because that's an area about which I personally have a lot of knowledge and experience. My Co-Director David Wroth and I really enjoy introducing visitors to indigenous art. It’s an awakening of the senses when someone first gets to see a piece of Aboriginal art they’re really drawn to and then it’s explained to them. They get to hear the story behind the painting and what the artist is trying to get across to the viewer. It’s very different to a lot of Western art in that the artist really wants you to know the story behind the painting. They want you to know about their culture. They have a pride in their culture and they’re trying to transmit that and spread it across the world really. We’ve started some major collectors off on their careers. They bought their first pieces from us. They’ve gone on to collect maybe hundreds or in some cases thousands of paintings and have become major benefactors giving artworks to State galleries and National galleries and things like that, but they bought their first piece here. To be honest, I really share their enthusiasm and I find that I probably get as much out of it as they do. I just find it really uplifting and exciting when someone sees the culture behind the art and they fall in love with it. You get to share that special time when they first fall in love with this art and that is so rewarding. Q: Really a big part of your role here is storytelling, is helping the paintings come alive. Yes. I guess a lot of people come here with a vague awareness that every painting tells a story or every picture tells a story, but they’re not really aware of the depth and the breadth of the stories behind those paintings. The vast majority of these paintings are spiritual. When you look at the painting, the story isn’t obvious. It's usually the artist who has supplied the story. 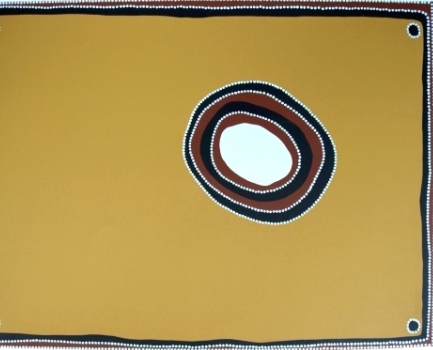 The vast majority of indigenous artworks are aerial views and maps of country. It’s not just the physical view. It’s also the metaphysical view because it’s about the spiritual stories behind that and what happened there and what made the land the way it is today. A lot of these stories explain why things are the way they are. Q: What advice would you give to someone thinking about buying their first piece of art? You’ve mentioned buying something that you love. Is there other advice you would give to someone starting out? I think it’s important to be able to buy with confidence. One of the things that David and I have been very strong about is ethics. My Co-Director David is an artist in his own right. From the very early days of the gallery, we determined that we would like to treat artists as we would like to be treated. Not every business has that approach and that’s been a problem within the industry. The main thing I think is to buy from a well-established gallery that has a good reputation. More importantly buy from one that is a Signatory to the Federal Government’s Code of Conduct or is a member of the other major organization Art Trade, the Australian Indigenous Art Trade Association. Those affiliations guarantee that the painting has been supplied to the gallery on an ethical basis. It has a paper trail to the artist. The artist is being well looked after because I know personally and I’m sure a lot of other people feel the same, I wouldn’t want to have a painting on my wall that I knew that the artist had been exploited or ripped off. That would strip my enjoyment of it entirely. Japingka has been a founding member of both Art Trade and the Federal Government’s indigenous Code of Conduct and big supporters of it. It’s a big part of what we are and what we’re about. I know artists appreciate that. At the end of the day, it’s common sense. If artists are being well looked after, then of course, they’re really happy and you get the best work whereas if artists feel like they’re being exploited, then believe me, the artists are well aware that they’re being ripped off and you can tell. I personally can tell when I look at certain paintings. You see much lesser paintings by great artists and you instinctively know what’s happened. I find that sad and unfortunately it still happens. You can never stamp it out entirely. It is something that we are making big strides to get rid of and something that everyone could do to help is to only buy from galleries or art centers that are signatories to the government’s Code of Conduct or who are members of Art Trade. Q: Do you remember the first painting that you bought? That’s a good question. Yes, I do actually, but it wasn’t actually a painting. It was an artwork. It was a limited edition print back in the ‘80s. It was by Rover Thomas and it was called Daytime Moon. I still have it today. It’s still hanging in my home. I love it. I’ve never tired of it. We actually have another one or two editions of that in the gallery today which are on the secondary market. They have been supplied to us. Rover Thomas was the first artist that really spoke to me. I love his style. I love the early ochre painters. I love the fact that he belonged to the less is more school of art. They look deceptively simple, but they are incredibly complex and the composition is perfection really. Q: You’ve had years of exhibitions showcasing some of Australia’s best artists. How do you get the artwork for these exhibitions? I guess that’s where we’re lucky. We have over 30 years’ experience. We know nearly everyone in the industry. We’ve worked and met with most of the actual artists in person and have great relationships with the artists and sometimes with their agents or with their art centers as well. Art centers are another important element of the indigenous art scene. They are owned and run by indigenous artists. They often appoint people to administer them, but they are a great source of paintings and they’re also a wonderful and effective way of preserving strong culture and cultural ties. We work with quite a few highly regarded indigenous art centers, and the majority of our exhibitions tend to be sourced from Art Centres, but in the past we’ve also worked with artists who work by themselves or through an agent. So to answer your question, first of all, the work must be ethically sourced. Secondly, it’s on the quality of the artwork and what appeals to us, what speaks to us. It really has to work as a great piece of art or work from an artist who excites us. Q: Have you ever seen a painting and had an instinct about a collector that you need to show it to? Does that sort of thing happen often? Often no, but it does happen. If you do get to know your customers quite well and their taste, sometimes you just come across something that’s quite special. You know that one particular collector would love it. You know that because you know what they’ve bought over the years or what they’re looking for. That’s quite exciting when you can bring something you think is a real find and bring it to their attention and even better when you’re right, they do love it and they’re really excited. Q: Can you tell me about the people that come to your exhibition openings. Is that demographic changing? It’s a very eclectic range of people. It’s very broad range from people in their teens up to people even in their 80s. It’s such a broad range. I don’t think I could categorize it. Each opening is different. Each opening is a different group of people. Sometimes you get people in suits or the vast majority are corporate people. Other times it’s very relaxed and it’s from all demographics. You get people from the Western suburbs, people from down south, from Joondalup, from Mandurah and even people from overseas or from the Eastern States. People who have made the trip up especially. Aboriginal art just seems to speak to everyone. It just draws a wide range of people. Q: What sort of things do you value in Aboriginal art? That’s a good question. I’m a bit biased so to me Aboriginal art now is the only art. When I first became interested in Fine Art, I started to appreciate Western art and I love the impressionists and the cubists and post-modernists, but really the only art that now really moves me is Aboriginal art. I guess it’s in part that you can’t categorize it. To me it is that all that variety, the depths of meaning that is so valuable. As a non-initiated Westerner, I’ll never know the full story behind aboriginal art. You have to be fully initiated to be privy to particular Dreaming Stories. Usually I find that the artist wants you to share in what can be shared. I guess that’s why I like it. They can tell you quite a lot about it without breaching their codes. To me it works on two levels. 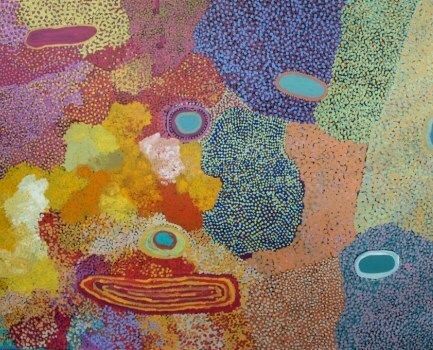 It works in this level of a story if you like, but aboriginal art can also work as abstract art. It’s not abstract art, but it definitely works on that level and that sometimes the first way that people are initially drawn to Aboriginal art. They see a painting, they just love the palette, the composition, the scale, the depth. They don’t know anything about the story, but they love the painting. Then when they learn about the story, there’s no doubt that adds another dimension to it, another level. I think that’s what I love about is the diversity of styles, but also the ancient culture that backs it up because that in itself is so complex. People often think it’s a simple culture. Nothing could be further from the truth. This is the oldest continuous culture on our planet. It is extremely complex. I guess most of all, I love the people producing the art. They’re just an incredible people, just so involved, so generous and so knowledgeable and there's a real joy of life that comes through in their artwork and is so uplifting. The other main factor is that this culture and art keeps evolving - it doesn't stand still and it's far from static. I guess that it is that whole combination of these unique factors and the fact that such an ancient art form and culture can still be so contemporary and speak meaningfully to the people of the 21st Century that makes it so valuable to me.